Having just turned six years old my twins are at an age where they have outgrown and aren't really interested in "preschool" oriented television shows but are still a little too young for much of the youth focused programming (often referred to as Y7). We came across a show the other day though that is a nice fit for kindergarten/first graders that my wife and I are comfortable with them watching and they just love called The 7 D. The show (rated Y - appropriate for all children) debuted on Disney's XD cable channel last year and is now also being rebroadcast on the Disney and Disney Junior channels as well. It is quirky and funny filled with adventures and gags that put smiles on my son and daughter's face throughout the show. 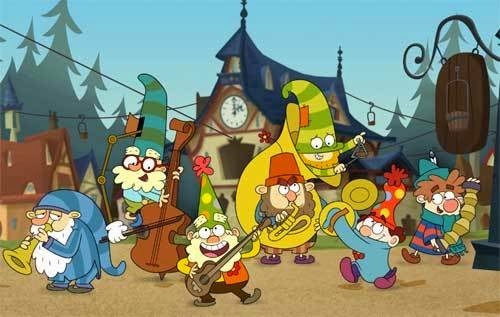 The premise of The 7 D is that this heroic band of dwarves hasn't met Snow White yet, maybe in this alternate universe they never will, and live in the fantasy land of Jollywood spending their days searching for gold and jewels in their mine and solving problems for their ruler Queen Delightful. Most of these problems involve a pair of villains known as The Glooms (Hildy & Grimwold) who are a bickering married warlock and witch that often are looking to steal some magical gem from the 7 D's mine as part of their plot. While children may not catch the association, parents will notice the show has quite a few familiar voices in it. When it comes to the bad guys, Hildy Gloom is voiced by Kelly Osbourne (nice to see her working and not just living off her rock star dad Ozzy Osbourne's wealth after the family's reality show went off the air) and Grimwold is narrated by Jess Harnell who also bring the character Chilly to life in one of my children's other favorite tv programs Doc McStuffins. Jay Leno also is in the mix serving as the voice for the Gloom's Crystal Ball that they use to help plan out their mischievous hijinks. When it comes to the Seven Dwarves, Bill Farmer who has voiced Goofy in numerous Disney productions throws his talents into bringing Doc to life, Perry the Platypus from Phineas & Ferb (aka Dee Bradley Baker) is Dopey, the red M&M from the television commercial promoting the candy (Billy West) portrays Bashful, and the Brain from Pinky & the Brain (Maurice LaMarche) voices Grumpy. Whoopie Goldberg serves Queen Delightful as the Magic Mirror. Fans of Will & Grace will recognize that the queen of Jollywood is played by the same lady who played Grace's best friend Ellen throughout that series run on tv (Leigh-Allyn Baker). Michael McKean who starred on Laverne & Shirley as the character Lenny and has since been a cast member on Saturday Night Light and appeared in numerous other movies and television shows serves as the queen of Jollywood's uncle - Uncle Humidor. 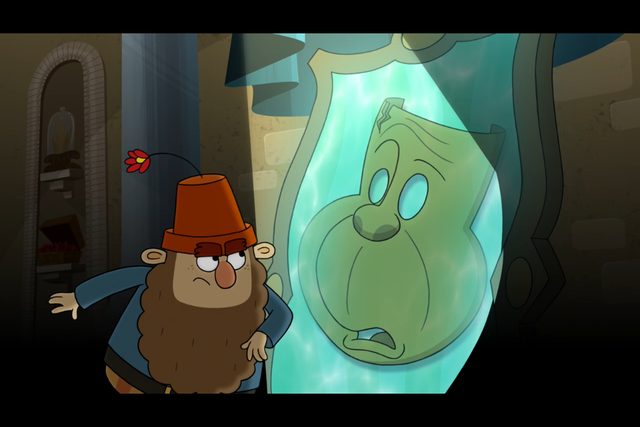 The 7 D gets A Geek Daddy nod of approval for being a charming and entertaining television program that will amuse both children and kids at heart of any age. Check out the show through your local cable provider or you can purchase episodes and download it digitally through services like iTunes or Amazon Instant Video. For more 7 D fun you can also download a FREE Mine Train mobile app game for Apple devices. It is pretty easy to play and has you steering a mine car through obstacles as you gather gems. Beware though because there are some in-app purchases in the game so you'll want to turn that feature off before letting kids play. Click here to download the 7 D Mine Train game on Apple's App Store. There is also a different FREE online game you can play on the Disney website called the 7 D Dwarf Track Builder. Click here to check that out. Trying to be cool about this, I shared this with my kiddos and they told me they already knew! They love it! Gonna be watching it with them.